THE Beacon is the bi-annual newsletter of the VSA/NE. It is issued to members by mail in the spring and in the fall. 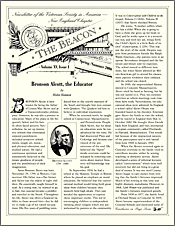 The Beacon includes not only information on lectures, walking tours, and special events, but also articles on Victorian arts, culture, history, architecture, and customs of the era. Edited by Edward W. Gordon, President, and Mary Ethel Grady, Secretary. Be sure to include the shipping address to which you would like to have your order sent! 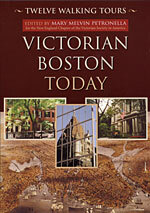 Published by Northeastern University Press, a member of the University Press of New England (UPNE), each neighborhood tour in Victorian Boston Today: Twelve Walking Tours provides immediate access to highights of Victorian Boston along with information about the Society and its work in the preservation of Boston’s unique heritage. Victorian Boston Today received the Ruth Emory Award from the National Victorian Society for excellence in regional history. In addition, the book was given a Five-Star rating from Amazon.com, and was presented a Certificate of Commendation by the American Association of State and Local History which recognizes outstanding accomplishments in collection, preservation, and interpretation of state and local history. Edited, and with an introduction by Mary Melvin Petronella; with a foreword by Edward W. Gordon. Maps by Charles Bahne.